Abutbul spoke to reporters at his office just hours before a mass demonstration is expected to take place in the city against the exclusion of women from the public sphere. 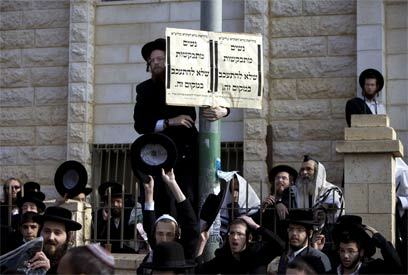 “Beith Shemesh denounces such behavior. Violent men belong behind bars. I urge Israel Police to act with a firm hand against all the rioters, and I call on you (the press) not to put all (the ultra-Orthodox) in one basket,” the mayor said. The mayor’s office rejected claims that municipality was backing the exclusion of women in the city. City officials mentioned that since Abutbul took office five women – all secular – were appointed to senior positions in the municipality. “The exclusion of women may exist on some streets or in some neighborhoods, but it has nothing to do with the municipality or its policies,” one official said. Jerusalem Police has completed its preparations for the mass rally, with hundreds of officers being deployed to maintain order and secure the demonstrators. On Monday the City of Beit Shemesh announced that it would install between 300 and 400 surveillance cameras throughout the city as part of the effort to curb the growing violence. jail like any criminal for such behaviour. because they needed their few miserable votes.